Esco proudly introduces its new family member – the Versati™ Centrifuge. Equipped with maintenance-free, brushless motor, this centrifuge gives you a low noise, smooth operation with superior mechanism design. A wide range of rotors are available for both micro centrifuge and tabletop centrifuge to fit all applications. 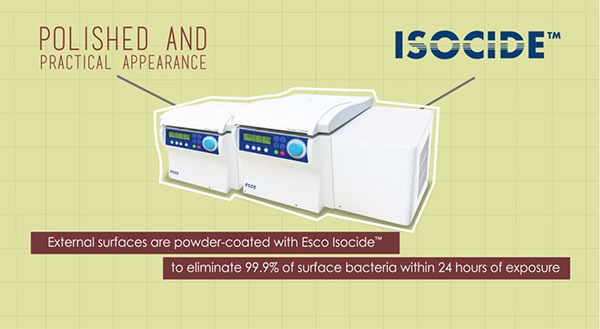 Moreover, external surfaces are power-coated with Esco ISOCIDETM to eliminate 99.9% surface bacteria within 24 hours of exposure.